Oscar Wilde meets Ernst Lubitsch in this witty society comedy. Lubitsch’s decision to jettison Wilde’s dialogue may raise some eyebrows but the Wilde spirit is intact and smart performances from Irene Rich and Ronald Colman are the icing on the cake. Ramon Novarro and Norma Shearer play young lovers divided by class in Ernst Lubitsch’s lavish operetta adaptation. Jean Hersholt steals the picture. Ernst Lubitsch’s take on Carmen is worth watching for one reason and one reason only. Fortunately, that reason is pretty good. Pola Negri is fierce, flirty and irresistible as the world’s most famous femme fatale. Rough and rowdy, this movie is Lubitsch before he finished developing his signature style. Still, it’s an amiable romp about a wayward husband, a clever wife and a very naughty chambermaid. One of Pola Negri’s earliest collaborations with Ernst Lubitsch and a major critical and commercial hit for them both, this film tells the famous tale of Carmen and her doomed romance. How will our dynamic duo make this story their own? Negri’s signature combination of sexiness, warmth and humor is on full display at this early date but the Lubitsch touch is still in its infancy. First of all, a big “THANK YOU!” to all the talented participants of the ongoing Snoopathon. You are wonderful and I couldn’t have done it without you. The GIF is from Lubitsch’s The Merry Jail (review here) and the dancer is Agda Nielson, who plays Mizi, a very naughty maid who has stolen her mistress’s gown and crashed a royal ball. Her unfortunate tablemate is an inebriated rich fella who is her target for gold digging. I love Mizi because she is just so happy. Ernst Lubitsch wows again with a surreal bit of comedy concerning a determined bachelor who buys a doll to pose as his wife, thus avoiding actually having to marry. The only problem is that the doll is a live woman, comedy star Ossi Oswalda. So we have a woman posing as a doll posing as a woman. Raucous, joyous and more than a little strange, this early Lubitsch is an unparalleled delight. Robot and Sprocket Cookies. Who says machines can’t be cute and tasty? What do you get when you mix a partying husband, a wily wife, a sassy maid and a night in jail? Well, when Ernst Lubitsch directs, you get a zany comedy of marriage and romance. Much wilder and broad than his later work, this early film has plenty to offer. The unexpected benefits of posing as an automaton: You can be as snotty as you like and no one can do anything about it. I mean, what are they going to do? Punish a machine? Ossi Oswalda is truly delightful in Ernst Lubitsch’s 1919 comedy The Doll. I highly recommend it, especially if you have only seen the darker German offerings of this period. Lubitsch’s saucy offerings will surely delight. Released both digitally and on DVD by Kino-Lorber and available for purchase in the U.S.
Pola Negri and Ernst Lubitsch team up once again in the deranged comedy that sends up romance, adventure and Hollywood. Pola is a bandit girl. Paul Heidemann is a ladykiller army officer. She captures him and steals his pants. He chases her all over a Dr. Suess-ian fortress. Oh, it’s a mad film. A little too mad, in fact. But Pola has never been more fun! 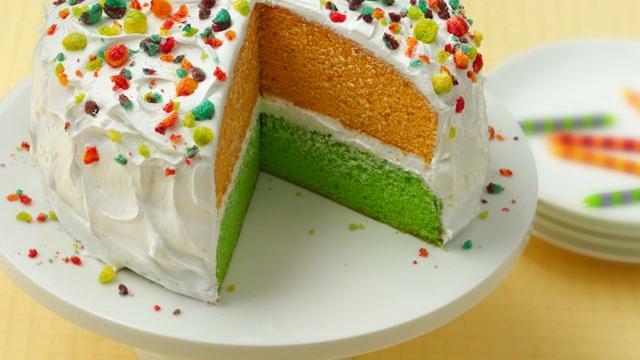 Trix Cereal Crunch Cake. Loud, zany and slightly psychedelic. May induce headaches on some days. On others, it may be just what the doctor ordered. Click here to read my full-length review. Recall the GIF I posted a few days ago with the guy asking the sun to please shine? Well, here is the result. Quite effective, I must say. The plot in one sentence: Daddy, buy me a prince right now! Ossi Oswalda is a nouveau riche American girl who is determined to marry into German nobility. Harry Liedtke is a penniless prince hounded by creditors. It should be simple but director Ernst Lubitsch has other plans! Slightly naughty but mostly nice, this clever romantic comedy is one of the gems of German cinema. Chocolate Stout Cupcakes. Cute confection improved immeasurably by the addition of booze. Come on, who wouldn’t trust these guys? Me, that’s who! I wouldn’t trust them. They couldn’t look less trustworthy if they were selling used cars! These scheming gentlemen are from The Doll and they are indeed up to no good. In fact, they are conspiring to steal the hero’s fortune. Ernst Lubitsch does it again in this delightful 1919 comedy. It’s baaack! Another modern movie re-imagined as a silent. This time, it’s The Princess Bride and it is taking a little trip back to 1928. If you have only seen Mary Astor and William Powell in the talkies, you may be interested to know that in the silents, she was often the dainty princess and he was often a sneering villain. Douglas Fairbanks Jr. did not try his hand at swashbuckling until 1937’s Prisoner of Zenda (Astor was in that one too) but I crave your indulgence because I think he is a perfect Westley. It’s early Lubitsch but his touch is there, right down to the clever intertitles. After all, this is what every father says when he is sending off his only child, right? Background: In The Doll, dollmaker Hilarius has just inadvertently sold his daughter to a customer. She was taking the place of a broken model for a demonstration but Hermann Thimig was so pleased that he bought the mechanical woman on the spot. Obviously, chaos ensues. Ossi Oswalda is posing as a mechanical doll and is it ever hungry work! No one can see her eat (she is a doll) which explains her frantic face stuffing. This GIF is from Ernst Lubitsch’s 1919 charmer The Doll. Pola Negri’s bandit girl leads her men on a raid but they end up completely wasted on stolen wine. Being a resourceful girl, Pola is determined to bring them all home again. Pola Negri’s feral little bandit girl in The Wildcat wants to get married. However, she has beaten up the boys in her gang once too often and so she only has one taker… and he is terrified! Ossi Oswalda’s character is an, um, eccentric young lady with violent habits. She smashes vases, mirrors, heads when she is happy, sad or in love. In this case, she is thrilled that her daddy has promised to buy her a prince to marry. Poor Prince Nucki (Harry Liedtke) comes to in a strange room and is confronted by something that is most definitely not his. Where are his pants anyway? Zany romantic comedy from Ernst Lubitsch. This is one of the funniest intertitles, in my opinion. Enjoy!